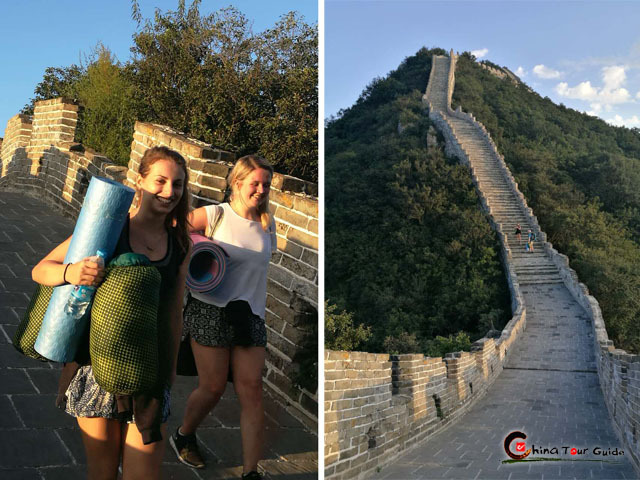 A fantastic chance to hike and camp on the Chenjiabao Great Wall, which is one of the most beautiful sections of the wild Walls around Beijing and never restored and less tourist. The highest sea level is about 1280 meters. Easy to Go - Minimal 4 travelers start a trip. You may also join a group! 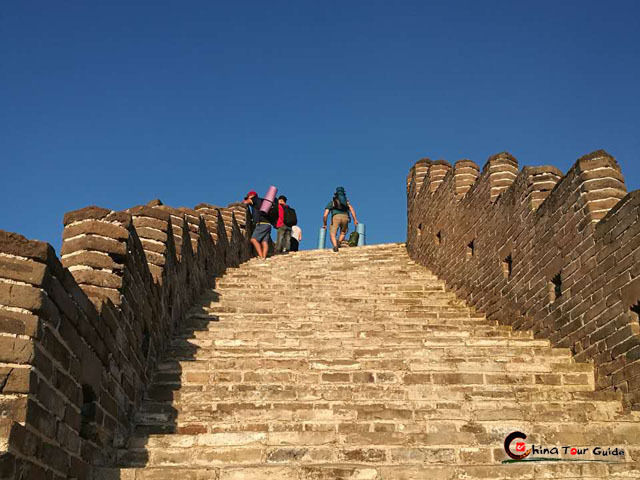 Today's Activities You will be picked up at your hotel (within 3rd ring road in Beijing) and depart around 12:30 at noon and take a 2-hour drive to Chenjiabao Great Wall. Lunch will be typical Chinese at a local villager's farmhouse. 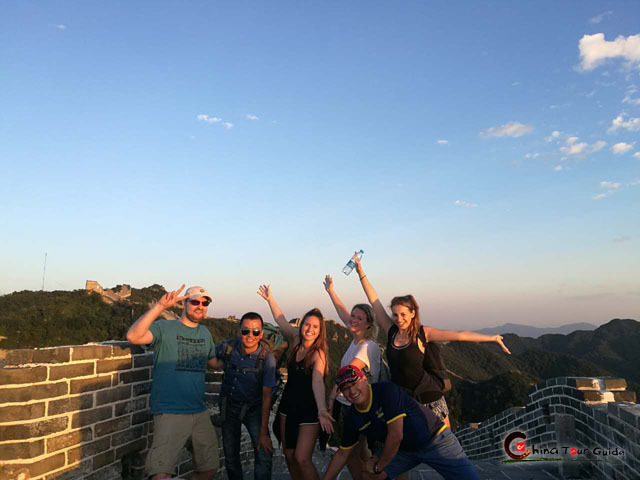 After lunch, hike on the Chenjiabao Great Wall. Enjoy the wild, ruined but original historical works. When it's getting dark, walk back to the towers on the wall and camp in a tent for the night (Note: Two people share one tent). 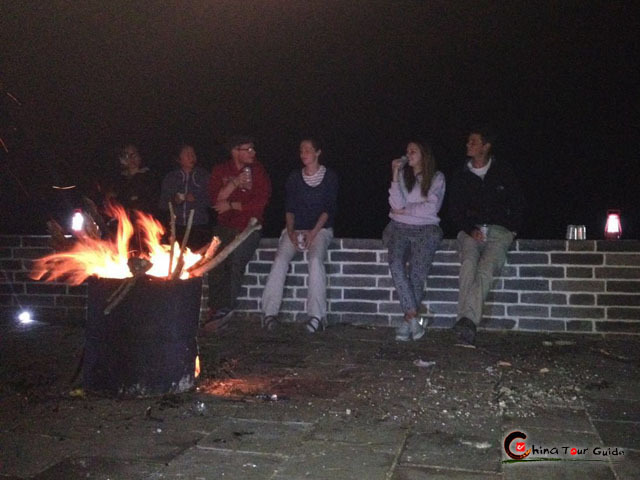 Enjoy the bonfire and barbecue (snacks/ chicken/ fruits/ beers/ lamb...). 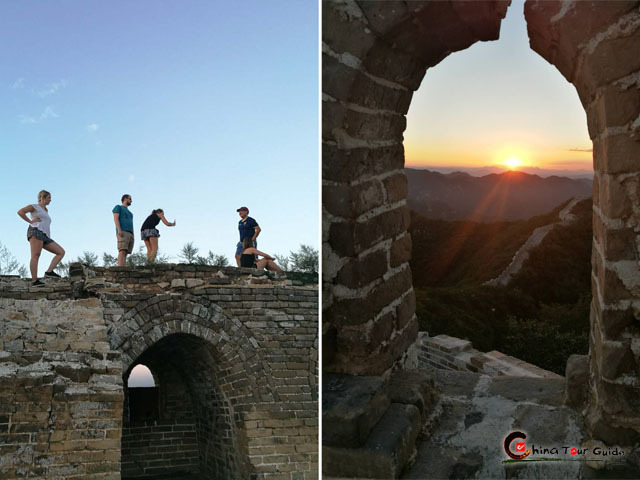 Today's Activities If weather permitted, you may take the chance to enjoy the sunrise over the Great Wall at around 6:00am. Then get ready to climb down the mountain at 8:00am. Take care of the steepness of the mountain. After climbing down the mountain, head to the farmhouse for breakfast at 9:00am and then return to your hotel in Beijing. 1. Don't forget to bring a mobile phone, water, hiking boots, sunscreen, sun-glasses, insect repellent, cap and some snacks etc. 2. 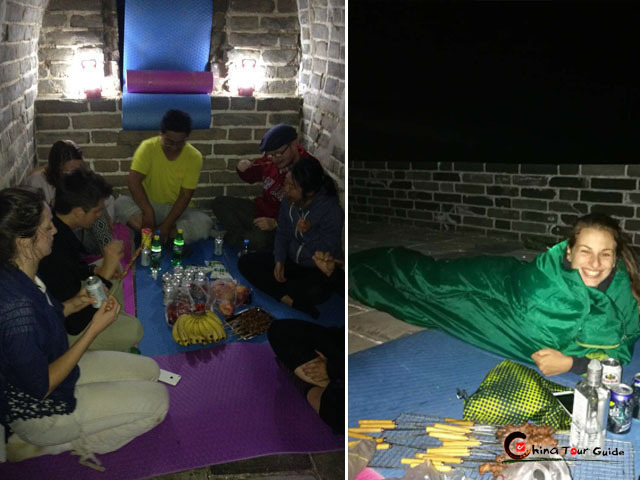 Stay overnight on the Walls with no toilets, no electricity and no plumbing (flashing lights will be provided). 3. Noise, vandalism, graffiti and litter are not allowed on the Walls. 4. 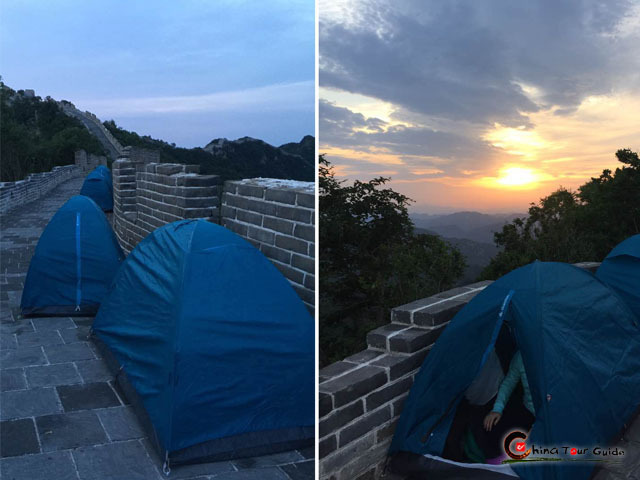 If any possibility of thunder, lightening or heavy rain (possible in July and August - Rainy Season in Beijing), the camping is cancelled and campers are re-arranged to stay in local farmhouse at the base of the Great Wall. 5. Please make sure you have goof fitness level for hiking and camping on the Walls. 6. You are strongly advised to purchase your personal accident insurance from your native country before you leave for China. 7. Child below 1.2m is 50% of charge. 8. 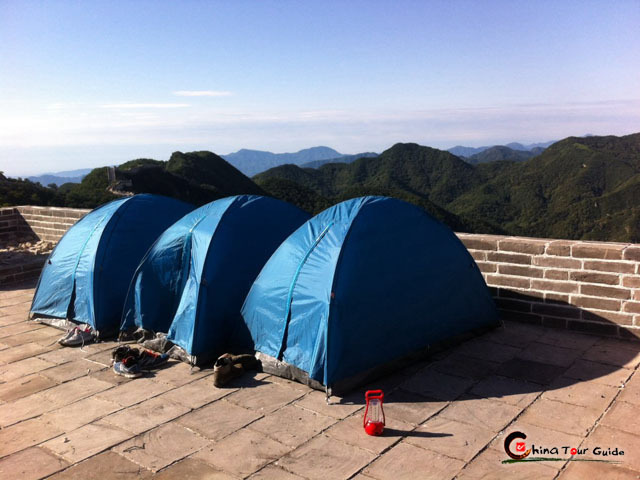 The supplement of single occupancy tent is RMB200/pax. 9. Please make your reservation at least 1 day prior to travel. -- Lunch is arranged according to different classes of tour.